Watch her ARTIST VIDEO HERE, produced by Sense Gallery. Merry-go-round is a solo exhibition that features all new works by Katie Pumphrey, including paintings, collages, and a site-specific installation that will evolve over the course of the exhibition. Pumphrey’s work explores the tension between chaos and calm. Crisp edges and quiet shapes are at a constant tug-o-war with playful movement and vibrating color. With turbulent brushstrokes and the suggestion of imagery, her work examines themes of reflex, confrontation, territory, and instinct. Merry-go-round explores the familiar and constant teeter-totter between control and chaos. We feel steady, level-headed, comfortable — and then something shifts, and we scramble to grab the wheel. The floor keeps spinning. We blink through blurriness, fight the dizziness, and move to find our footing. Again, the meter resets. We ping-pong between these moments, time and time again. It’s a dance we know the moves to, a game of repetition we constantly play. Again and again, we ease the tension and harness the commotion. Over and over and over again, we get on and off the carousel. 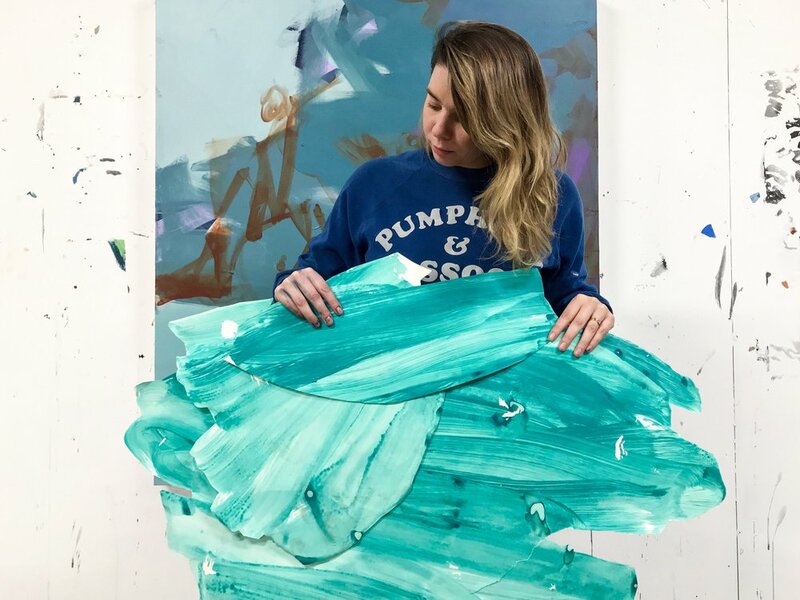 Katie Pumphrey is an artist living and working in Baltimore, MD. 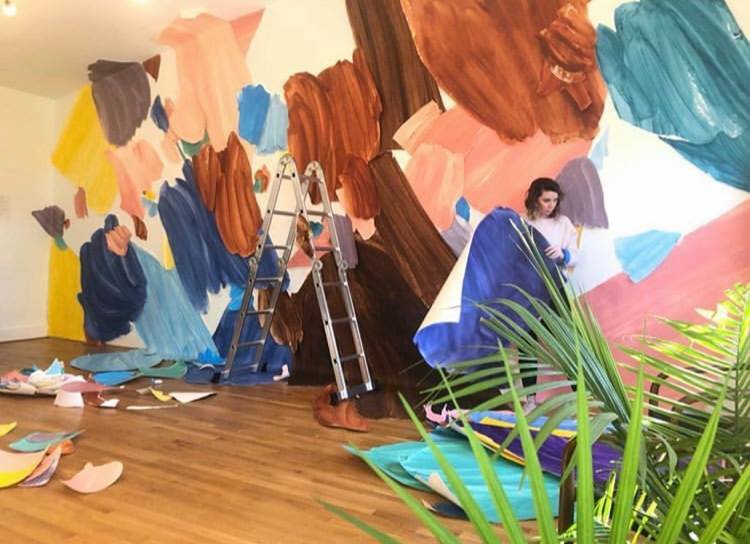 Through large-scale painting and installation, Katie Pumphrey’s work explores the tension between calm and chaos. Crisp edges and quiet shapes are at a constant teeter totter with playful movement and vibrating color. 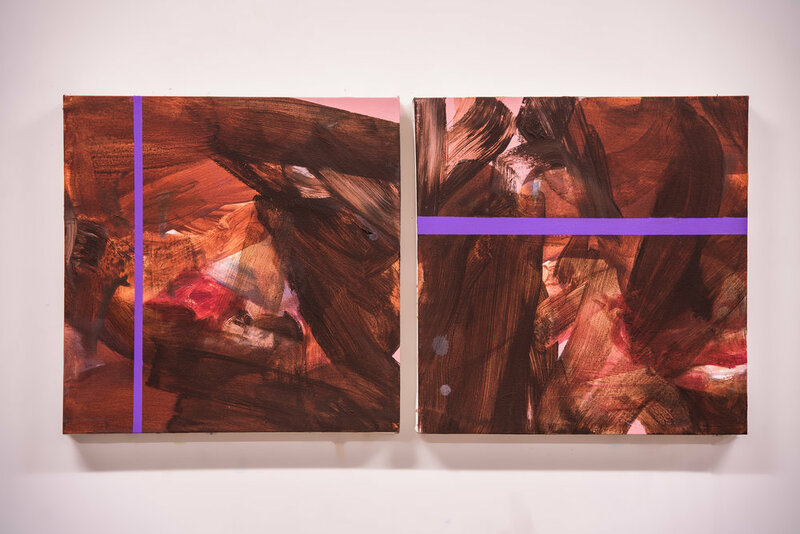 With turbulent brushstrokes and the suggestion of imagery, her work examines themes of reflex, territory, and instinct. Katie has a Bachelor of Fine Arts from the Maryland Institute College of Art. 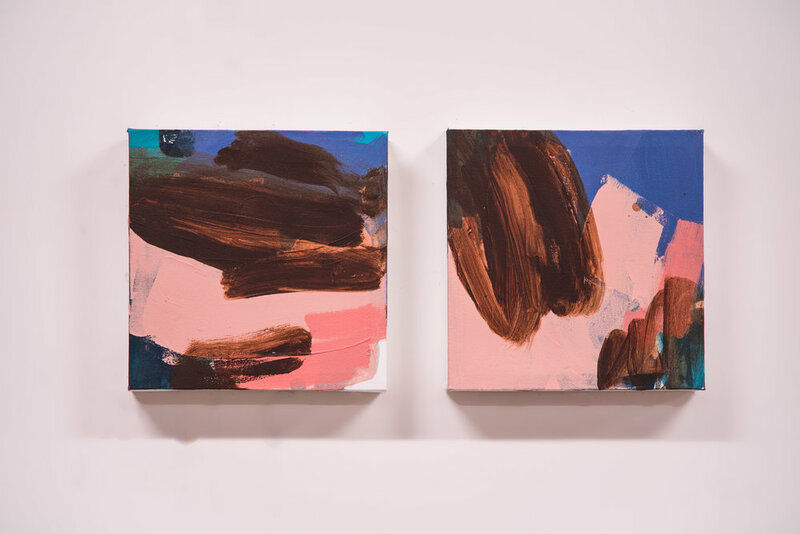 She has participated in artist residencies at the Studios of Key West, Vermont Studio Center, Gallery Four, and the Creative Alliance in Baltimore. Her work has been exhibited nationally, including solo exhibitions in Baltimore, Washington DC, Alexandria, and Key West. Katie is also a long distance, open water swimmer — who swam the English Channel in 2015, around the island of Manhattan in 2017, and the Catalina Channel in 2018. Those three swims make up the Triple Crown of open water swimming, adding Katie to a elite group of open water swimmers from around the world. This aspect of her life often influences and drives her work. Follow her process, practice, and new works on instagram.